Meow! : New Roller Girls Tees at Meow! New Roller Girls Tees at Meow! Just got a new batch in the shop! Meow! 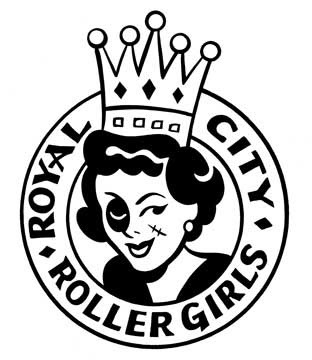 Guelph is pleased to be a sponsor of the Royal City Rollergirls --the new Guelph roller derby league! We now carry league t-shirts if you want to support the girls or just want to look cool in a bitchin' garment --check out the one being worn by rocker-actress Juliette Lewis, pictured above. --featuring a fantabulous logo designed by local alt cartoonist, New York Times illustrator, and all-around stylish gent Seth. New logo colours! Purple and gold on black, purple and gold in retro disco glitter on black, and the classic white on black. Unisex and women's styles available. Quality silk-screened on 100% cotton. All proceeds go to support the Royal City Rollergirls --equipment, training, and practice space. Available at MEOW!, 10 Carden St., downtown Guelph (across from City Hall). Check out the Royal City Rollergirls website or on Facebook!